Geraldine D. Bonomo, age 78 of Sandwich, IL passed away on Saturday, March 16, 2019 at her home. She was born on December 21, 1940 in Chicago, IL the daughter of Adam and Lucille (Wozniak) Grabowski. Geri was united in marriage in Chicago, IL on August 25, 1963 to Mr. Anthony Joseph Bonomo and they spent the next 48 years happily together until his passing on June 9, 2012. Mrs. Bonomo was an active member of St. Paul’s Catholic Church in Sandwich, IL. Geri was employed for 10 years as the Secretary to the Dean at IMSA in Aurora, IL. For several years, Geri had served as an Election Judge in Sandwich, IL. 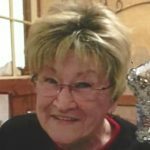 She was a member of both the Sandwich Fair City Quilters in Sandwich, IL and the Common Threads Quilters in Sugar Grove, IL. Geri was a loving wife, mother, grandmother, and great-grandmother who will be deeply missed by her family and many friends. Geri is survived by her daughters, Gina Marie Bonomo of Sandwich, IL and Tonilyn (Jerry) Pannell of Oswego, IL; her granddaughters, Kristin Schwartz and Ashley (Jordan McDowell) Schwartz, both of Oswego, IL; her great-grandchildren, Mackenzie Schwartz, Colton Rediehs and Ashlynn Rediehs. She was preceded in death by her parents, Adam and Lucille Grabowski; and her husband, Anthony Joseph Bonomo. Arrangements by Nelson Funeral Homes, www.NelsonFuneralHomes.com or (815) 786-6461. Geri and Tony were the sweetest people. They gave me such encouragement when I was in nursing school. I spent many a New Year's Eve and other times with Gina Marie and ToniLynn as the babysitter!! My love to you all.